I recently read this article on iVillage and it prompted me to write about why I don't post all the bad bits. I read through the comments that others posted on the article and they were mostly negative toward the writer. I'm not quite sure why it was even titled "Why I fake it on Facebook" because from what I read it just sounded like this mum only shared the good bits, and avoided posting the negative bits. Well, I'm the same and I agree with this mum [writer]. I don't post all the 'bad' bits either. Nobody needs to know that I forgot to change a nappy before putting bubs to bed or that my 18 mo still can't say 8 words like the charts/stats say he should, or that I've had the same load of washing in the machine for 3 days now! I know I'm not the perfect mother but I already know that I'm a wonderful mum trying to do my best! That's what we're all doing, right? Doing our utmost best for our children who we love dearly. And if I never saw a negative post from a mum on Facebook I don't assume she's perfect or that shes never served up a Vegemite sandwich for dinner. I think she's just another great mum powering on in her role as mother and that she chose to see and post the good above the bad! When I do have bad days I usually make a call or shoot a text to a close friend who's also a mother. Another mum who totally gets that you're in tears because you've been up all night with a baby and you've just yelled at your toddler for - you're not sure what! She's had those days and moments too. Why set myself up for judgment and negative criticism by posting to the world! Or why should I post in hope that I'll attract enough attention for people to tell me how good a mother I am and, so that I get a bunch of people sending me messages asking me if I'm alright or need something. But most of the time I don't want or need someone to rescue me I just need an understanding ear. If I'm not alright and I want to talk about it then I should initiate that. The [not so secret] truth is, that being a parent is damn hard sometimes! And just today I've had a rough morning! I've got two sick babies who are also out of whack because they both had immunizations on Friday and, I am so tired and sleep deprived because my normally sleeping baby wants my attention at 2 hr intervals! Whilst hanging out the washing that had been in the machine since Monday, Rupert got filthy dirty playing with the pot plants, and in my attempt to wash him in the shower he also peed on the bathroom floor and proceeded to walk through it with his dirty feet. That's just part of my morning. It's also just all normal everyday kid stuff but on those off days it all seems bigger then Ben Hur! I am not a perfect mother but I try to choose the positive route. I don't want my facebook page to be a whinge-fest just to prove I'm human. All us mums already know what it's really like behind closed doors anyway. We know non of us have it all together, even if it appeared that way. I'm honest about my imperfections with others and I love learning from other mums too. Social media just isn't always the right place for it on a continuous or regular basis. So whilst I've just shared about my mundane rough morning as a mum (which I will not be posting to facebook) I also want to share my positive 'tidbit' from today. 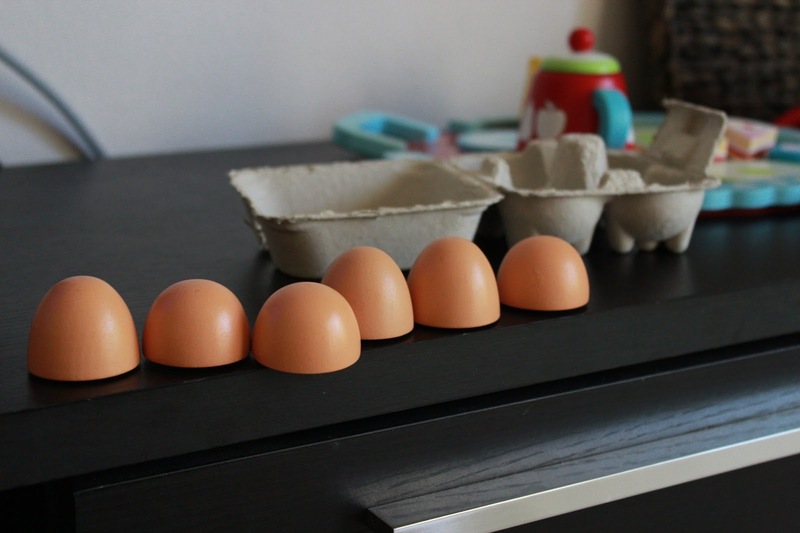 The picture you see at the top of this post, are wooden play eggs lined up on the tv cabinet. I was so delighted when I turned my head from the laptop to hear and see my Rupert bear counting (in baby lingo) as he placed halved eggs side by side. It was both cute and clever. This is the 'bit' I choose to dwell on and remember. Well said! Sometimes I wonder if I make my life look 'too perfect' to everyone else, but I am a very positive person, and I literally don't feel like I have a lot to complain about! Sure we don't have a lot of money right now, I'm having a bit of a body-hate week, and the house is a mess because it seriously is so cold I'm not moving from the heater. But I really don't feel the need to post to facebook about it. I'd rather post my awesome sugar-free chocolate pudding and show the world that I'm feeling happy!! (Personally I can't stand those 'cryptic' mopey posts people put up on facebook, making everyone say "Aw, what's wrong darl?" "R U ok??" .... GAH!! You're an awesome mum and the photos of your little men melt my heart. Thanks for the encouragement! ummm... you had me at "chocolate pudding"! hehe.